Buying a home is the largest investment most of us ever make, but home buyers typically receive little or no information about how much energy they will need to power the homes they see listed for sale (or for rent). This is despite the fact that energy is the highest cost of home maintenance – not to mention one of the most volatile. Historically, this information was simply not available, but programs like U.S. DOE's Home Energy Score now provide energy consumption and cost estimates for more homes than ever before. The primary barrier to widespread access to energy information for homes on the market is there is no system in place to transmit this data directly from sellers trying to market homes to the real estate listings buyers use to compare them. To patch this data hole, various stakeholders came together to form the HELIX team in 2016 through a U.S. DOE State Energy Program grant hosted by Vermont. The purpose of this project is to develop a database capable of automatically populating real estate listings (whether they are accessed through local Multiple Listing Services (MLS) or portals like Trulia and Zillow) with home energy information from Home Energy Score and other sources when it is available and approved by the seller. We are calling this database the Home Energy Labeling Information eXchange, or HELIX for short. HELIX is a first of its kind project that focuses on the Northeast region – the six New England states and New York – while also aiming to provide a replicable, open-source model that can be used elsewhere. The project will include training delivered to real estate professionals as well as continuous engagement with stakeholders in the Northeast real estate market order to ensure a useful product. The project will culminate in full implementation of the HELIX database across the seven-state region in 2018. Extensive solar market growth in recent years has resulted in a disconnect between the valuation of residential solar photovoltaic (PV) systems and the real estate market. Similar to the confusion around valuation of energy efficiency attributes of a home, solar panels create confusion around how to properly appraise a house. Therefore, making solar PV information easily accessible to real estate professionals, as well as homebuyers and sellers, will create greater awareness and value of the benefits of solar in the residential marketplace. To overcome this disconnect, Lawrence Berkeley National Lab (LBNL) is utilizing the HELIX database, recognized as a flexible and customizable database capable of integrating diverse energy data fields, to auto-populate multiple listing services (MLS) with solar PV information. The main objective is to dramatically expand the auto-population of solar PV data into MLS listings so that the real estate industry can properly account for this asset during the valuation process. 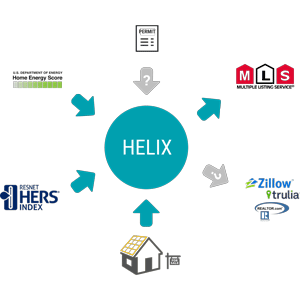 To do this, LBNL has partnered with NEEP and ClearlyEnergy (the HELIX software developer) to enable HELIX to accept solar data and provide this information in real estate listings. With this grant, funded by LBNL and the U.S. Department of Energy, the HELIX team is excited to expand the capabilities of the database in order to transform the real estate market towards valuing energy efficiency and renewable energy assets with the ultimate goal of greater savings, more comfortable living spaces, and the decarbonization of our residential building sector. RFP: Request for Proposals (RFP) regarding the HELIX project: After review of responses, ClearlyEnergy was selected as the IT contractor to build HELIX. The HELIX project has been made possible by the U.S. Department of Energy, Vermont Public Service Department, Massachusetts Department of Energy Resources, Rhode Island Office of Energy Resources, NHSaves, Energize Connecticut, and continued input from stakeholders from across the Northeast region and beyond.